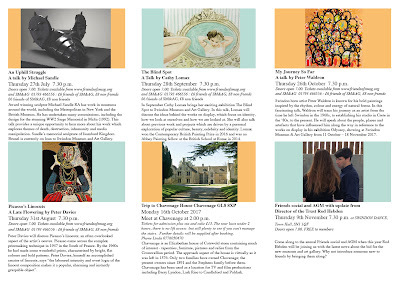 These popular free sessions start at 12.30pm, and are often in the main gallery, although not always. They usually last half an hour, with the speaker talking for 20 minutes and allowing 10 minutes for questions. The last one I went to was on the 23 June, given by Curator Sophie Cummings, she started by choosing a few paintings to comment on in the Bomford Gift exhibition in the smaller part of the gallery, and then went onto the London School exhibition where again she chose a few paintings to discuss. There are also seats available if needed. 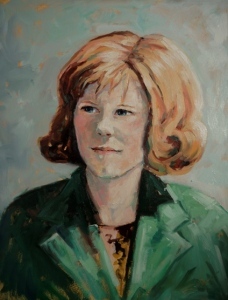 Today's FLT is in the downstairs gallery at 12.30pm, Dr Susan Carr will be giving people an informal tour of her portrait exhibition ‘Paint me this way!’. 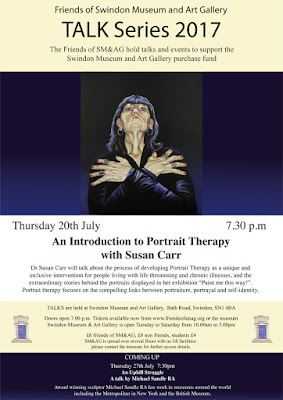 Discover the connection between portraiture and therapy in this inspiring exhibition and the extraordinary and moving stories behind the images. Great news, we now have our talks and trips flyer for the second half of 2017. I appreciate it's not easy to read them, hard copies will be available from the museum tomorrow. 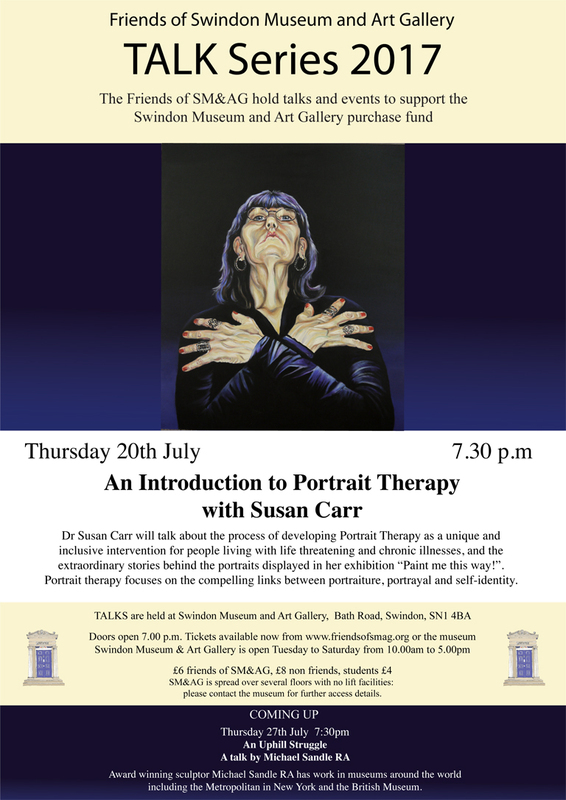 The first evening talk, not on the flyer, is by Susan Carr entitled 'An Introduction to Portrait Therapy' on Thursday 20 July at 7.30pm, doors open at 7pm. Susan's exhibition of the same name opens this Wednesday in the downstairs front rooms at the museum. 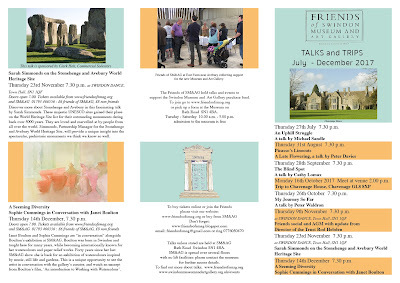 Susan will also be giving a free lunchtime talk this Friday 14 July at 12.30-1pm. 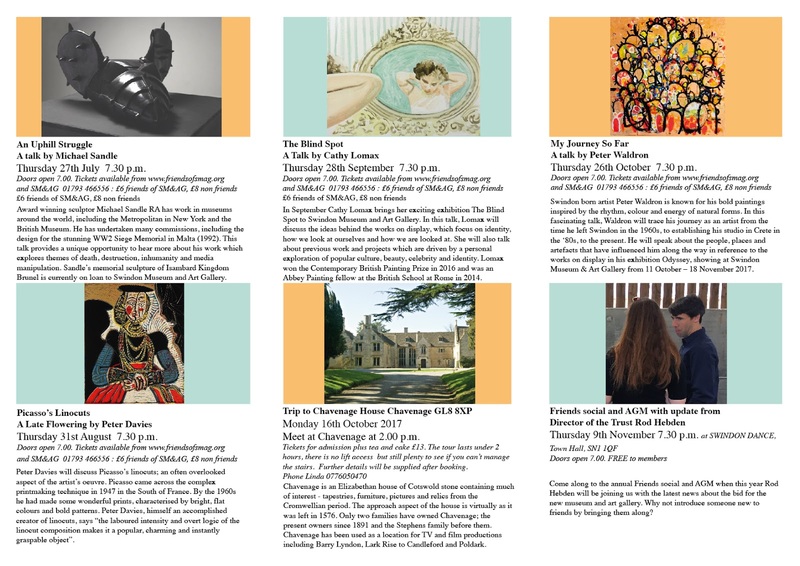 There are lots of lunchtime talks and activities at the museum over the summer, please visit their website for more details. Tickets available for the evening talks from our website or from the museum. For the last 3 years, Stef Vincent has been the Museums Collections Project Manager, taking on a variety of HLF funded projects with the aim of discovering, documenting and interpreting the objects stored by SM&AG. Last Thursday evening, Stef gave a hugely entertaining and enlightening talk about some of the challenges she's faced over the last 3 years, demonstrating the fact that we're extremely lucky to have her in charge of ordering the chaos. There were some interesting things from the stores that Stef had laid out to give us an idea of the nature of some of the artefacts. I was interested in this piece which is ornamentation from a harness, it still has some of the enamelling on it. I'll ask Stef about the age. You may have seen in yesterday's Swindon Advertiser, an article about the fact there are now 2 human Egyptian mummified hands, seen below. 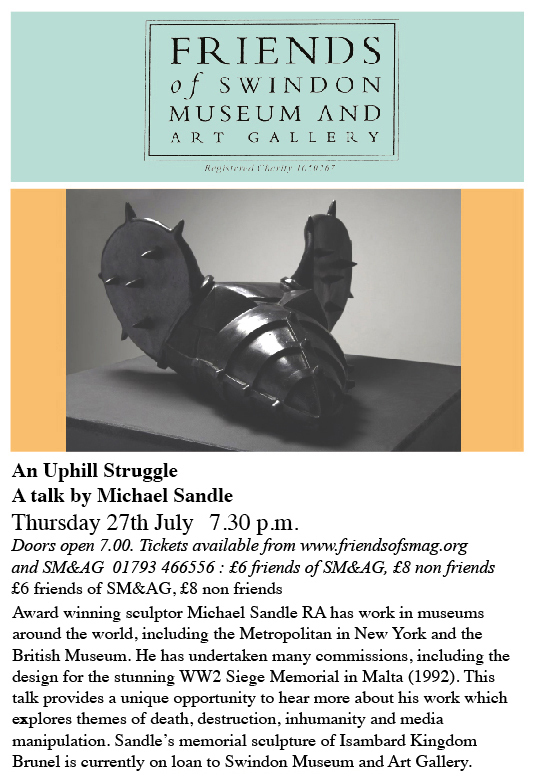 The article is written by Tom Seaward, who not only showed a great interest in the talk, but also joined the Friends that night. They are apparently both left hands. Here's Stef talking to a large audience. Stef said that there's always a question about how many objects there are in the 5 large storerooms, the answer is there are probably 100000, and this number will double in the next 5-7 years as archaeological finds are made when the eastern villages are built. It's not just a matter of straightening boxes and cataloguing what's in them, Stef has to understand, centralise, care for and let us all know what's in the stored collections. Charles Gore, a significant collector of minerals and fossils, has the amazing accolade of having the museum founded to hold his collection; he's also had 2 ammonites named after him. There can be a problem with chemicals such as mercury, arsenic and silver used to preserve materials in the herbarium. I was intruiged by the 38 wall paintings from Burderop House which can't be displayed until they are in a more stable condition and have been conserved, this would cost approximately £120000. 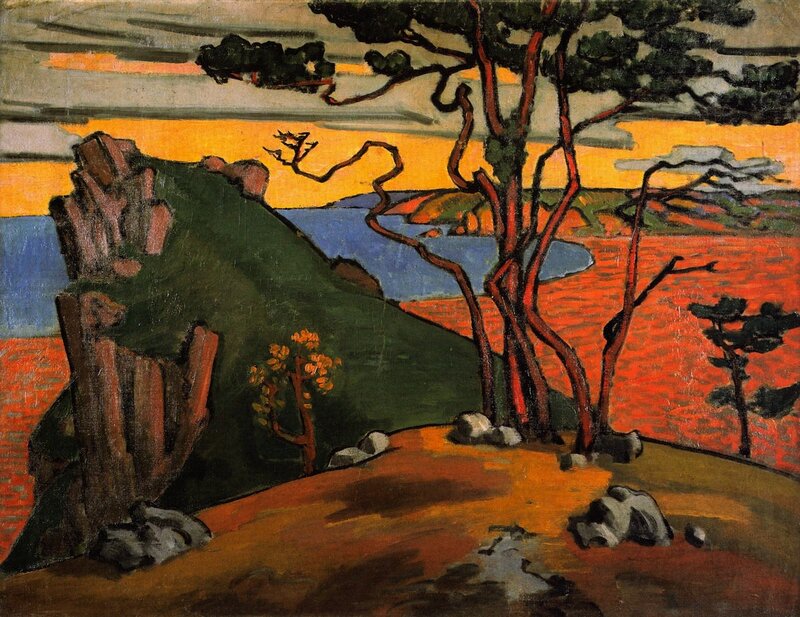 It in fact depicts Studland Bay!! A member of the audience asked about handling things, and some things can be handled, this will be built into exhibitions at some stage. There are 35 people who have contributed to this work by volunteering, 5 of those have gone onto paid employment as a result of their experience in Swindon. Stef mentioned the Kate Tryon paintings which spent many years at the Richard Jefferies Museum, Stef gave a lunchtime talk on these a few months ago, and we were able to see them being conserved. I'm pleased that our organisation, the Friends of SM&AG have been able to contribute to both HLF funded projects Stef has been involved in. And of course make sure you have signed a supporter's postcard. On the 13 June, a minibus load of us went to visit Hauser and Wirth, near Bruton in Somerset which I've been wanting to visit ever since it opened in 2014. It's a pioneering world-class gallery and multi-purpose arts centre, which acts as a destination for experiencing art, architecture and the remarkable Somerset landscape through new and innovative exhibitions of contemporary art. A landscaped garden, designed for the gallery by internationally renowned landscape architect Piet Oudolf, includes a 1.5 acre perennial meadow, which sits behind the gallery buildings. We started by having lunch in the nearby allotments, and then met our guide, Leslie Glenn Damhus, who gave us a very comprehensive tour of H&W for 90 minutes. From the galleries, we walked into the garden, which is a delight. and after being shown around by Leslie, looked at individual beds, identifying plants wiht my Oudolf Field guide. At the entrance to the garden, these two Louise Bourgeois Eye Benches III 1996-1997 made from Black Zimbabwe Granite are fabulous, although very hot on that day. and these raised veg beds. I will also mention we had an exceptional cream tea before leaving. above glorious alleyways, and below Stephen Davy-Osborn suggested we visit At the Chapel for coffee and other refreshments. Checking out the website, I discover you can also stay there. It's worth having a look at the photos of the bedrooms. The remains of this building can be seen form H&W and from Bruton, so it must be easy to walk from the town to Hauser and Wirth. Open Farm Sunday is an event held all over the country annually, It is a fantastic opportunity for everyone, young and old, to discover at first hand what it means to be a farmer and the fabulous work they do producing our food and managing the countryside. I thought it was something that only happened on the Archers until Gill Swanton invited the Friends and Museum staff to the event, encouraging us to spread the word about the bid for the new building, aided by the model. Gill was right, it was a wonderful event, with lots of interesting stalls, activities, food. We met lots of people who hadn't realised we were putting in an HLF bid for a new museum and art gallery in November. Another general photo of people looking at the model and talking about it. Outside the barn, there were long queues at the food stalls, I particularly enjoyed my hog roast bap.